Dr. Katerina Diamantaki is Assistant Professor at Department of Communication of Deree-ACG and Adjunct Professor at the Department of Communication of the Open University of Cyprus, where she teaches courses in communication theory, applied communication, new media, social networks behavior, and computer-mediated-communication. 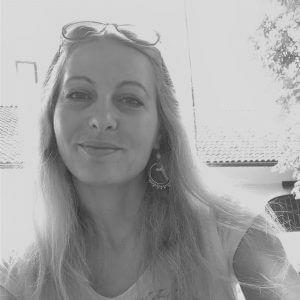 She holds a Ph.D. on virtual communities from the Department of Communication and Media Studies at the National and Kapodistrian University of Athens. She holds an MA in Media and Communication Studies from the same department, and a degree in Politics from the University of London. Her research examines mediated realities from a social-scientific perspective, focusing on how digital and online media impact on social interaction, community-building, politics, memory, and space. She has participated as a Communications Researcher in various research projects on the subjects of online political communication, media discourse, educational technologies, science communication, and locative media and smart technologies in an urban context.